Let’s add some closure to the failing of my MacBook hard drive. I received the new drive the following day. It was waiting for me at my front door when I awoke, awesome. But wow, no signature required on a $400+ package? Brought the box inside, and before I ate breakfast I had my old drive out and the new drive it. Which was quite a pleasant replacement experience, proving that Apple defiantly intelligently engineers it’s products. Then I plugged in my FireWire drive, booted from Leopard Cd, formatted drive and restored from back-up. 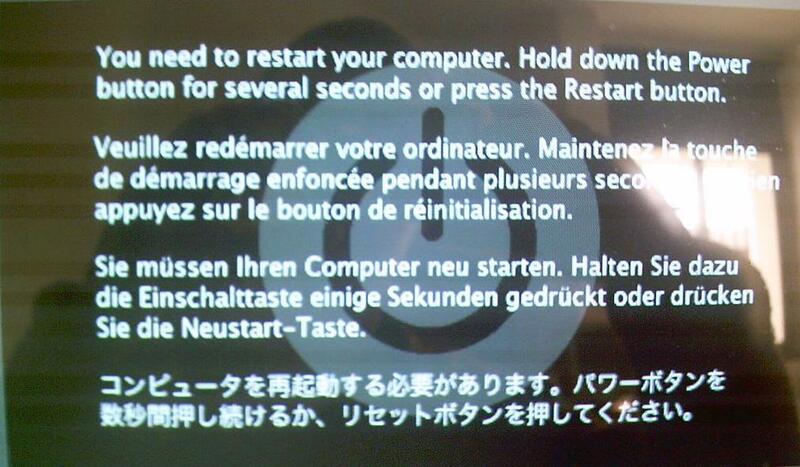 Within 2 hours plus I was back up and running, and everything was just like it was the day my old drive had failed. This entire process was beautiful. Other then having to send my old hard drive back to apple, I am quite pleased and have never had a more pleasurable hard drive crash. Needled to say I have pre-ordered Apple’s Time Capsule, just to have an additional backup layer. Just stumbled upon this video, compliments of Dave Winer. Do yourself a favor and watch this video. If anything, just to hear Jon Stewart rip on dudes Bow Tie. I whole heartedly agree with John, not just about the Bow Tie, but everything he so casually details. About a year ago, I covered this from a different perspective. In this episode of 60 Seconds I talk about the Tata Nano; a truly awesome piece of motor madness. The specified cost of $2500 is what really blows me away. That’s the price of a 15-inch MacBook Pro, does anyone else see anything wrong with this?